Quick Question Drop-In, Monday-Friday, 2:00 – 4:00 p.m. and Tuesdays 5:30 p.m. – 7:30 p.m.
Monday, March 25, 9:00 a.m. – 4:00 p.m. and 5:30 p.m. – 7:30 p.m. If you are considering a course withdrawal, it is important that you make an informed decision. There are many components to consider, such as financial aid, scholarships, housing, and insurance, among other things, and your decision should not be made lightly. You can also schedule an appointment with your assigned advisor in the AAPC online through Appointment Manager on the Academic Services tab of MyCharleston, and the AAPC offers daily Quick Question Drop In hours, Monday-Friday from 2:00 p.m. – 4:00 p.m. and Tuesdays from 5:30 p.m. – 7:30 p.m. on a first come, first served basis if your question qualifies for Quick Question Drop In advising. Please note that Spring Break is the week immediately prior to the last day to withdraw with a grade of”W”. Mandatory advising for first year students is underway! Please schedule an appointment with your academic advisor prior to your Fall 2019 registration entry time. You may schedule your appointment online through Appointment Manager or call our office at 843.953.5981. To prepare for your advising appointment, complete the Academic Advising Homework (PDF). You can also visit our Preparing for Your Semester Advising Appointment page for suggestions of how to make the most out of your advising appointment. 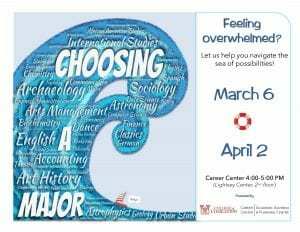 If you are a currently enrolled, degree-seeking undergraduate student in the second semester of your sophomore year, you must declare a major by Wednesday, February 20, 2019. Visit our Declaring Your Major page for more information on the major declaration deadline. Attention first semester transfer students! Transfer Advising Days for currently enrolled first semester transfer students are from January 28 – February 15, 2019. Schedule your mandatory advising appointment online using Appointment Manager on the Academic Services tab in MyCharleston or call 843.953.5981 today!